HomeTeensMotor and Mental DevelopmentRight-Handed or Left-Handed …..?! When can I know that my baby is left handed or right handed? Your baby's preference for her right or left hand may start to appear as early as 6 to 9 months of age. Even so, you won't be able to determine true right- or left-handedness until your child is 2 or 3 years old, when she'll begin to favor the same hand consistently. And some children may be ambidextrous (using both hands equally) until they're 5 or 6, when they finally make a choice. What factors will influence the handedness of my child? 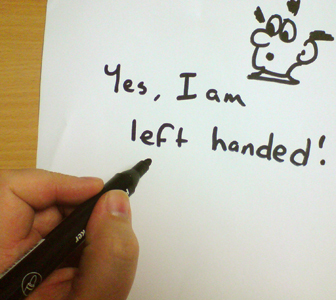 10% of people are left-handed. Hand dominance is greatly influenced by genetics. If both mother and father are left-handed, the child has a 45 to 50 % chance of being left-handed. Can I do any test to reveal my child handedness? If you're curious about which side is going to become dominant in your baby, try offering him/ her a toy. If he/she's started to develop a dominant hand, he/she's more likely to use that one to reach for it. What if my child hand dominance started earlier than that? If your baby seems to be using one hand exclusively before he/she's 18 months old, talk to your pediatrician, as early hand dominance may be a sign of motor development problems. Can I help my left handed child to be right handed? It's not a good idea to attempt to influence your child hand preference. Forcing him/ her to use his/her right hand when he/she's really a lefty is unlikely to work in the long run and will only confuse or frustrate him/her along the way. Can my baby recognize himself in the mirror?